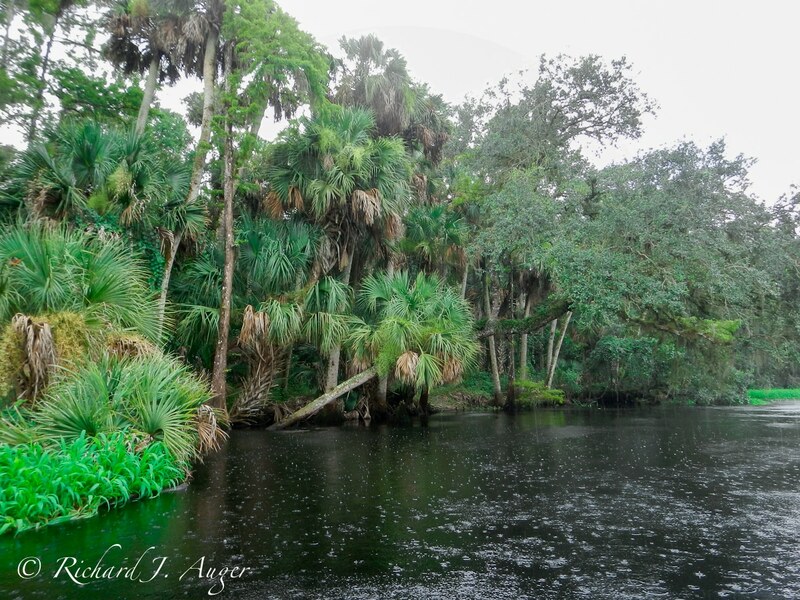 Fisheating Creek starts in the southwestern portion of Highlands County, Florida, and after about 40-50 miles it flows into Lake Okeechobee in Glades County. Interestingly, Fisheating Creek is the last natural, free flowing tributary of the Okeechobee. Check out the history of the river; its story is very interesting, including the occupation by Native Americans, as well as a fight to acquire its surrounding lands from the Lykes brothers. Finally, in August 2012, I made a special day trip and launched from the Fisheating Creek Outpost, which was rustic, but beautiful and well maintained. 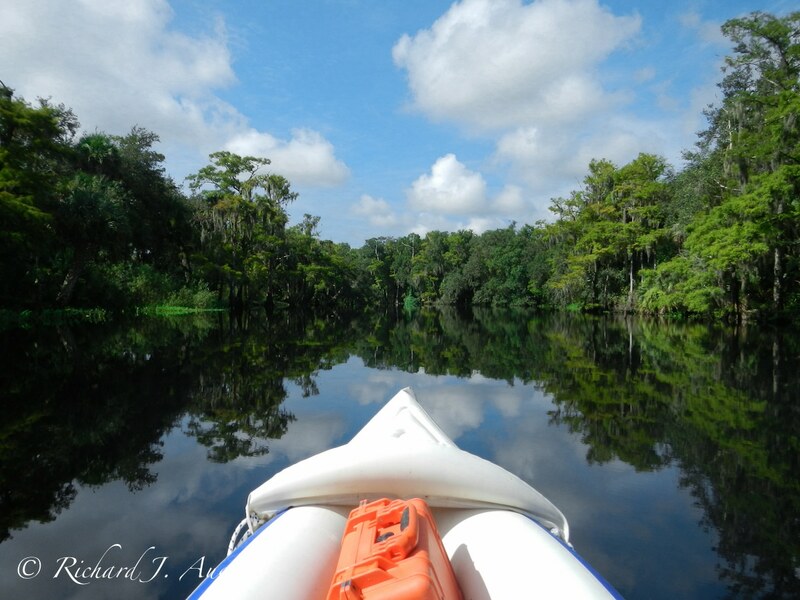 The scenery was nothing short of spectacular, with majestic cypress, oaks, cabbage palms, and wildlife. A thunderstorm was brewing overhead, providing a diffused lighting for most of the day. Rain always helps for landscape photography, as its adds richness to the tones of wood and foliage. 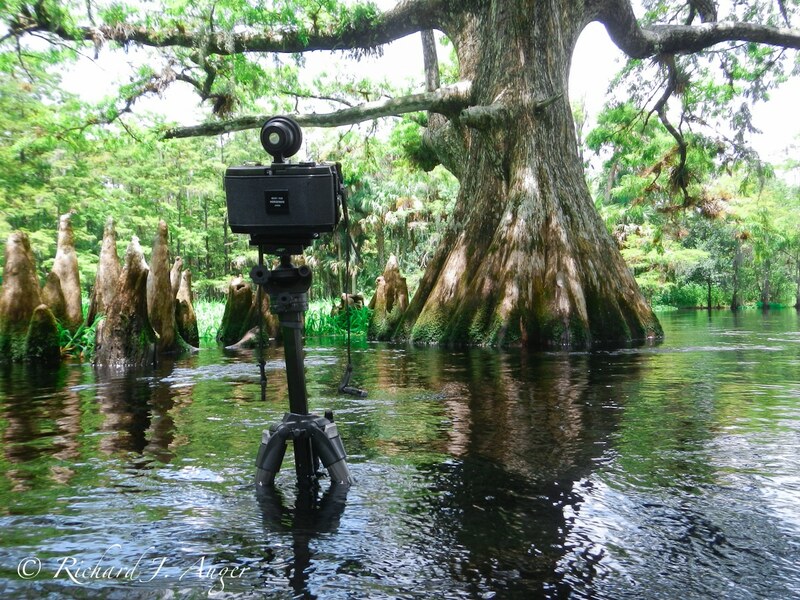 The river varied greatly in depth, which made setting up a tripod a challenge (see behind the scenes photos). This made it difficult for me to wade the river for very long, so I only exited the canoe on the most scenic portions. I used my paddle to test the depth level before walking event a few feet from a shallow area, as dropdowns in the sandy river bottom were common. Below, as I circled this tree, I was amazed at how it went from 6 inches to 5 feet of water in only a few steps. The heavy summer rains had brought luscious greens, but this also helps with black and white film, where the tones of greens look nice and even. 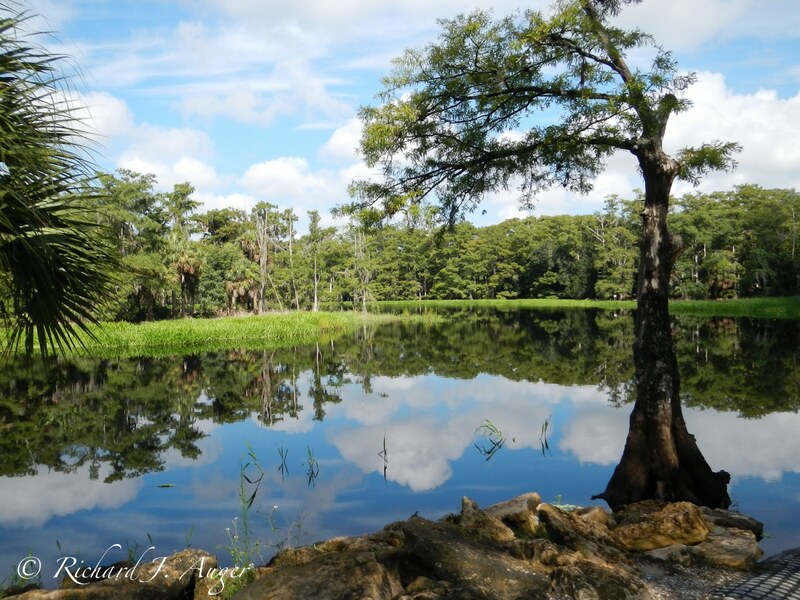 Memorial Tree, Fisheating Creek, Highlands County, Florida. Photo by Richard Auger. Horseman SW612. Rodenstock 35mm f/4.5 Apo-Grandagon Lens. Normally I wouldn’t show the same tree from another angle, but wow, this tree look so different from each side. Some idiots had etched their named large into this side, which didn’t quite appear in the photographs. Note that here I am much lower to the ground, getting toward neck deep in water. Memorial Tree 2, Fisheating Creek, Highlands County, Florida. Photo by Richard Auger. Horseman SW612. Rodenstock 35mm f/4.5 Apo-Grandagon Lens. Fisheating Creek had other beautiful trees, but this one was especially photogenic. Fisheating Creek Oak, Highlands County, Florida. Photo by Richard Auger. Horseman SW612. Rodenstock 35mm f/4.5 Apo-Grandagon Lens. My paddle up and down the river was relaxing and fun; I’ll probably be back again next year. Since I photograph Florida for a living, I love that I can enjoy its natural splendor without any weekend crowds. My Fuji point and shoot digital (with a housing) was finally having problems, so I got the waterproof Nikon AW100 at Costco just to snap along the river and get some better behind the scenes images for the blog. Read the captions, and please comment and share! Fisheating Creek Dock. Photo by Richard J Auger. Fisheating Creek – open portion of the river. Photo by Richard J Auger. Fisheating Creek – the water level and current barely let me take this shot with my Horseman SW612. Photo by Richard J Auger. 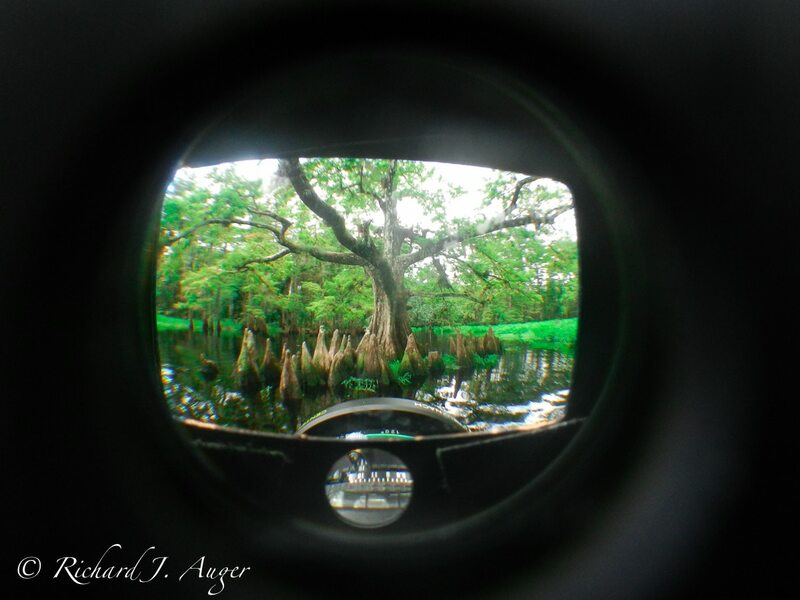 Fisheating Creek – Memorial Tree though the viewfinder. Photo by Richard J Auger. Fisheating Creek. It rained a lot, which I love as a photographer. Photo by Richard J Auger. I have been on the creek many times to fish.You have caught the rare beauty that many fisherman rarely pay attention to. Most of my fishing ventures have been from SR 78 out to the big Lake “O”. I have been in at campground on US 27 and it very scenic heading east. Look forward to every trip and it is always changing.